Posted on February 12, 2010	by Lou Murray, Ph.D.
Wow, what a day I had yesterday (Thursday). I picked up an email Wednesday night informing me that I had work on Thursday with the Orange County Conservation Corps. Not much notice! 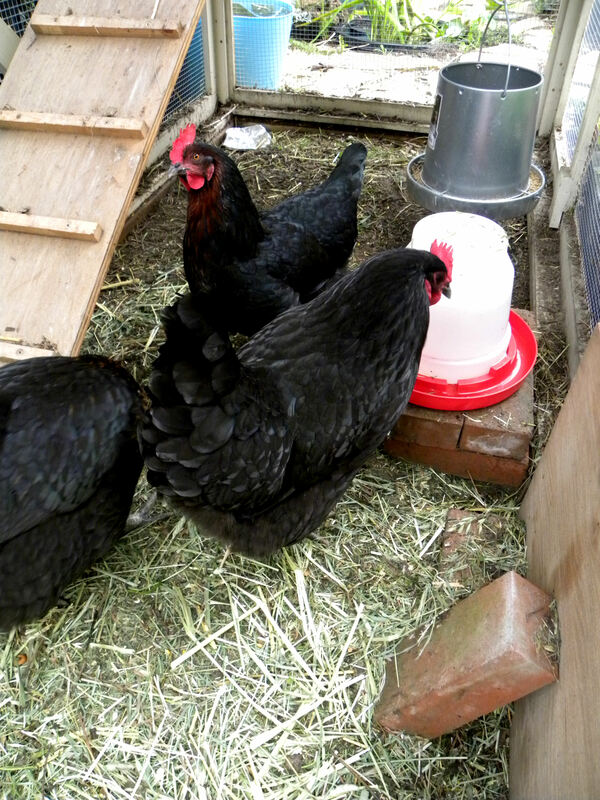 Unfortunately, Thursday was also the day that I had planned to clean the chicken coop, my first attempt at this task. The "egg door" on our chicken coop drops down for easy cleaning of the coop interior. I put the dirty bedding into the composter, covered with damp, chipped leaves, and watered it all. 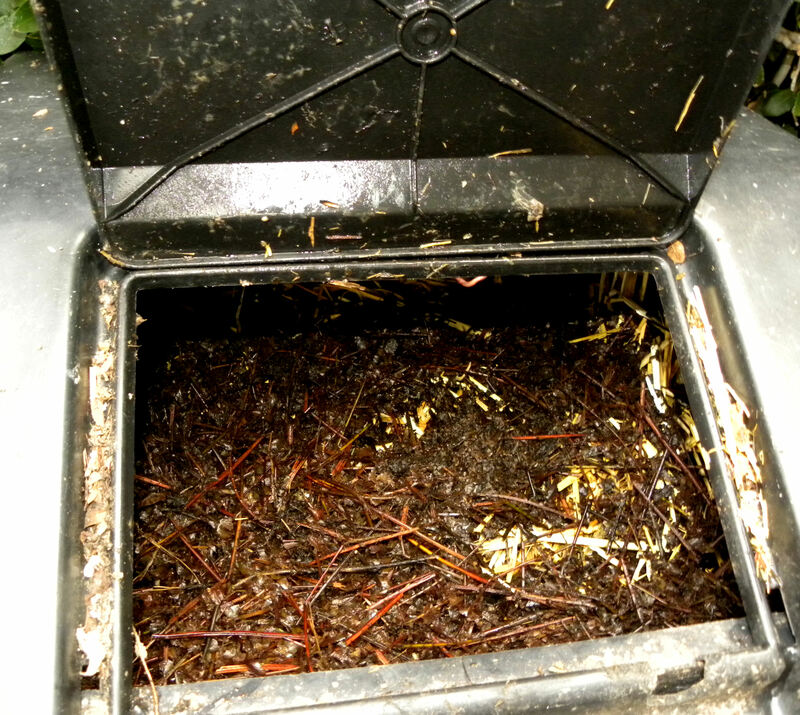 The composter is nearly full now, but with decomposition, the level will drop almost foot in a week or two. When I take compost out of the bottom, the level drops by about two feet. I only work part-time with the corps. More later about what it is that I do with them. 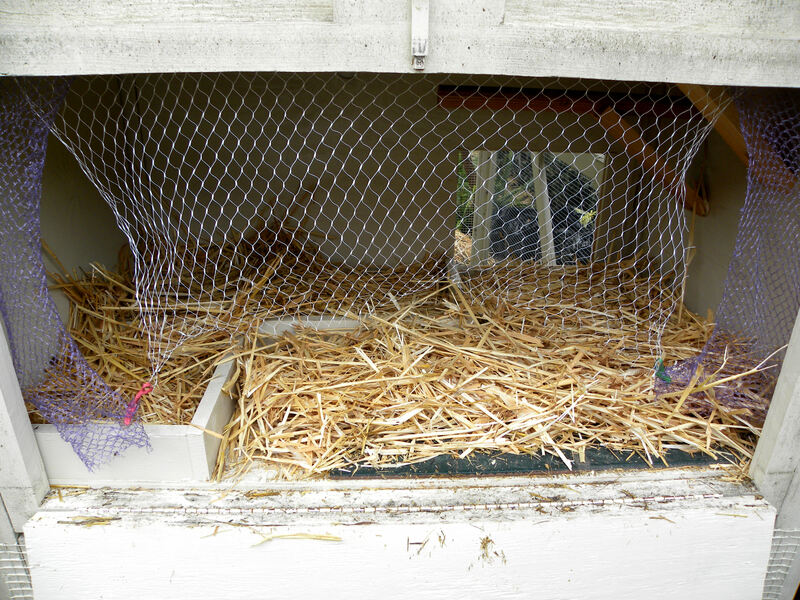 This close-up of the coop interior shows the three nest boxes on the left (but they only use one of them, the one in the far left back corner), as well as the roosting poles, which are nearly out of sight in the upper right. Poop falls onto the straw on the right side, leaving the nest boxes clean. Tiles on the bottom of the coop floor make clean-up easier. To get it all done, I was up just before dawn. I cleaned out the bedding in the coop, raked the run clean, filled the pellet feeder, cleaned and refilled the waterer, put clean straw in the coop, added some timothy/alfalfa hay to the run, sprinkled some “scratch” around on top of the hay, added a handful of limestone/oyster shell to help make thick eggshells, added the coop cleanings to the compost bin, covered it with chipped leaves to prevent odors, and added water from the rainbarrel to speed decomposition. Whew! 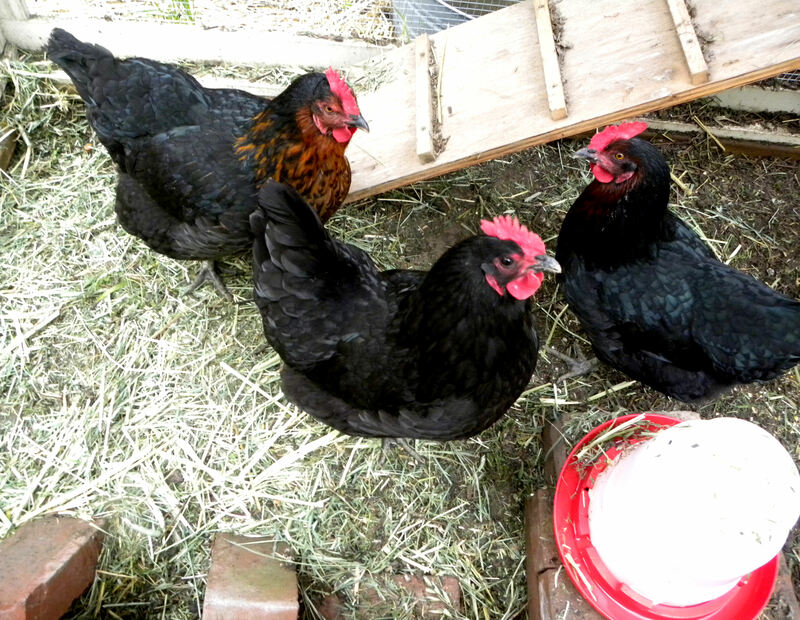 Henny Penny, Henrietta, and Chicken Little in their clean coop. I grabbed a quick shower, got dressed, loaded my car with all the teaching materials that I use for my OCCC crews, and headed off to buy donuts for the crew. I met them at the Bolsa Chica Ecological Reserve. Long view of the coop run. Each hen has 10 sq. ft. in the run, the minimum amount of space. The coop itself adds another 7 sq. ft. and is built over the run to save space. My job at the corps is to teach conservation awareness to the newly hired crews. With budget cuts, they’re not hiring a new crew very often, which means I’m not working very much except for my weekly newspaper column. The upside to this is that I’ve had time to work on my garden, get my hens, and start this blog. My “kids” at the corps are mainly male Hispanics in their late teens or early 20s. Most of them are dealing with issues that include gang membership, probation, drug/alcohol addictions, single parenthood, homelessness, or poverty. They come to the corps to complete their high school educations and get their diplomas while earning a living. They start work at 6:45 am, work until 3 pm, then attend classes until 5:15. Most of them finish within a year, and go on to good jobs. We provide them with social services that include counseling, AA/NA meetings, a food bank, and leadership training, as well as resume preparation, career counseling, and much more. I dearly love these kids and respect them for all of the hard work that they do, not just to get their diplomas, but to change their lives. My classes are small, so each person gets individual attention. Orientation crews are generally between 8-12 young adults. In addition to conservation awareness, I teach them about professionalism and generally positive characteristics, and offer them some clues to happy living. Their first day in the field is with me. After they finish my orientation class, they go onto their regular work crews. Most of the crew above will be working on the burned areas in Orange County, protecting homes, historic sites, and infrastruction from mudslides. Before the budget cuts, we used to work on conservation projects around Orange County in my orientation classes. In the past, I’ve showed my various crews how to plant California native plants, how to identify non-native plants, and how to perform the various techniques used for removal of those non-native plants. Now the program is all education. Their day with me includes performing a wildlife survey of invertebrates, fish, reptiles, birds and mammals at the Bolsa Chica Ecological Reserve. My corps kids are full of energy and a lot of fun for me to work with. We have a great day together. My goals are for them to learn that work is fun, and so is education. At the Bolsa Chica Conservancy’s Interpretive Building, they handle live snakes and marine invertebrates, while learning about ocean and wetland conservation issues. Then they fill out a worksheet that teaches about conservation issues in Orange County’s various habitats. After my work day, I went grocery shopping, filled the wild bird feeders at home, steamed some asparagus and collapsed on the couch, grateful that we had leftover quiche and leftover soup from the night before. I’m glad that all my days aren’t this full. Hope you enjoyed this little introduction to my kids at the corps. They’re terrific people who are at a place in life where they’re making great change and heading in a more positive direction. To learn more, visit www.hireyouth.org. I love my homies! 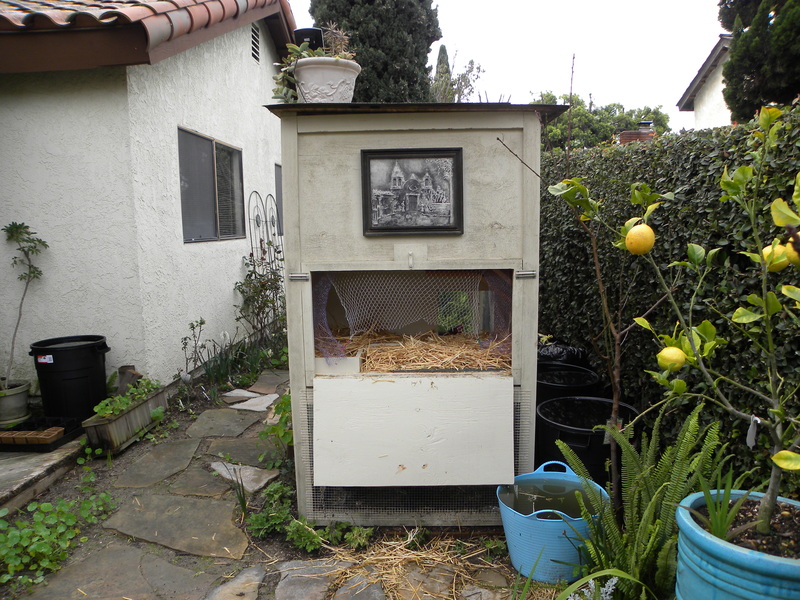 This entry was posted in Uncategorized and tagged backyard chickens, Bolsa Chica Conservancy, Bolsa Chica Ecological Reserve, chicken coop, conservation, education, gang members, hens, Orange County Conservation Corps, urban chickens. Bookmark the permalink. This world needs more adults like you to help our youth. Having worked with at-risk youth in the Maine Conservation Corps, I have a lot of respect for you and the work you do. I think the Conservation Corps in this country are generally great programs. Thanks for the work you do! Hi Ali, although we’re at opposite corners of the country, we have a lot in common–hens, gardening, Conservation Corps work. Folks, be sure to visit Ali at henbogle.